Happy Monday! Before getting into my book review and giveaway, I wanted to share my weekly meal plan. I’m trying a couple of new recipes this week included a veggie filled pasta sauce from Jamie Oliver and a tasty-looking chicken recipe from All Recipes. I’ve never been good at pan frying so this should be interesting. To me, summer meals are all about ease and pre-prepping so when you get home you can make everything really fast. We’ve been enjoying the longer days and like to swim in the late afternoons. For more meal plans, see Org Junkie. Monday: Chicken Fajitas with all the toppings. I often get sent products and books to review. I like to review products that I think my readers will find helpful. While I know some of you are out of the baby and young toddler stage — many of you are in it or planning to be in it again (and again and again). When I decided to make baby food for Big A, I was disappointed that there were no up-to-date books on introducing solids. Actually, this is one of the reasons I started the blog — to keep parents up-to-date on the latest and greatest research regarding childhood nutrition issues. The Best Homemade Baby Food on the Planet is written by a nurse and dietitian. It is well organized, easy to follow and chock full of nutritious recipes for kids 2 and under. Of course these recipes can still be used for older kids such as Strawberry -Banana Tofu Smoothie, Banana Buttermilk Pancakes and Awesome Avocado and Egg Sandwich. While a majority of the book is filled with recipes, the authors also help clarify key issues like whether or not to buy organic and how to prevent cavities and choking. They also provide a checklist of everything needed to make baby food — and they really keep it simple which I like. I don’t think any new parent has hours to make food! The book also includes a feeding chart on when to introduce different foods. It still recommends waiting to introduce allergenic foods but I think the literature is starting to go the other way — encouraging parents to introduce such foods earlier. We still need more research and no doubt this is a confusing area. I encourage parents with a family history of food allergies to choose a pediatrician who specializes in this area. 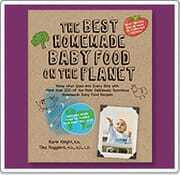 This is a great book for any parent looking to get started making baby food. I still recommend parents get a resource on how to feed, such as ones from Ellyn Satter, which recipe-based books don’t address. We all know around 2 kids become pickier and feeding more challenging and it is vital to be prepared for this lengthy stage of development. 1) Mandatory entry: Leave a comment telling us why you would like to win this book. 2) For another entry, tweet this post or share this post on Facebook. Leave another comment. 3) For a third entry, sign up for Raise Healthy Eaters’ email updates or RSS Feed. If you already subscribe, tell at least one friend about Raise Healthy Eaters. Leave another comment saying what you did. 4) To increase your chances further, like Raise Healthy Eaters on Facebook. If you are already a fan, like The Best Homemade Baby Food on the Planet. Leave another comment saying what you did. The winner will be chosen using random.org and will be announced on Raise Healthy Eaters’ Facebook page. The giveaway will ends in one week — Monday, July 18th at midnight. I would love to win this book so I can read it and learn from it as a grandma, and then give it to my daughter who is raising a darling 2 year old boy and will be giving birth to a baby girl this month. She has her hands very full and I’m sure she’d like to learn some new tricks! Thanks! I shared your blog with a friend – with a 3 yr old, 1 yr old twins, and one (only one! yes!) on the way. This would be amazing, the book sounds like it’s right up my alley! I’m currently pregnant with baby #3 -my first boy!!! I have a 3 yr old and a 2 yr old and we are all about eating healthy and organic and teaching others to do the same! I would like to win becaause I made some of my ownbaby food for my son I would like to make more for my second. I would LOVE to have this book…i just gave birth to a gorgeous little boy (12 days ago!) and i know he’ll be super grateful for some yummy food in a few months! I have a 3 month old little girl and this stage is just weeks away for me! We made all if my son’s baby food and he is an incredible water as a result. Can’t wait to try some new things out with my kiddos. Sure hope I win! My Daughter would be so excited to own this…baby girl 3 months old and a toddler! I liked Raise Healthy Eaters on facebook too! After more then 5 years I am having another baby. Never thought it would happen but so overjoyed. I have forgotten so much especially about starting solids. I made so many mistakes with my older boys (making seperate meals, etc.) that I feel like I have a chance at doing it right with boy #3. I would love this book. I will Like Raise Healthy Eaters on Facebook. Thank you. I am starting to explore the world of home made baby food with my 6 month old. I desperately need something to give me ideas and recipes as we explore this whole eating thing! I signed up for the Raise Healthy Eaters email updates! 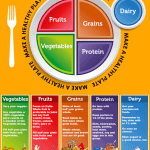 I liked raise healthy eaters on facebook! Ask the Dietitian: What Should I Do When My Child Refuses Dinner?